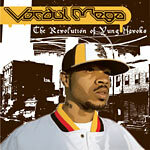 Vordul's solo album after the Cannibal Ox split, he comes correct as heck. This album is nothing short of solid and if you are a fan of CanOx, then pick it up. 1 produced by Opio, 2 by Ruddy Rock, 3 by Soul Purpose, 4,6,7,9,10,13 by Belief, 5,8 by Dev, 11 by Blockhead, 12 by Omega One.